At last Summer is here – so take off those Winter layers and put on a little Summer number (maybe a swimsuit judging by the temperature!) Here at EcoHip, we are committed to keeping the nation healthy so this month, we remind you put on sunscreen. Whatever your skin colour or skin type you need protection and we have just the thing with eco friendly products like Variosun Spray. I really believe our skin needs some sun (vitamin D) after months of dreary English weather but we must avoid the dangers too. You may find you need higher protection on some parts of your body: I always use factor 24 on my face and chest. My skin is actually a different shade to my face and toes so I do use quite a selection! 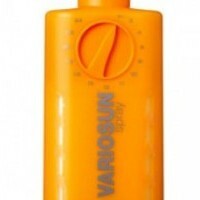 This used to be a real pain with so many bottles but then I discovered Variosun Spray – it’s genius! It is one bottle, with ALL the factors. All you need to do is turn the dial to the SPF you require. I also love the fact that once the cartridges of SPF2 and SPF24 are used up you can simply replace them and keep hold of the bottle, saving the pennies and the environment too. If you are planning on going on holiday it saves on space and weight as you just need one bottle and extra cartridges and the whole family are protected. Check it out here. The bottle is so cool, just turn the dial and the SPF2 and the SPF24 mix the correct quantities to give you the required SPF. Today, with such high temperatures I think I’ll only use the highest SPF and get in the garden. So, have fun in the sun, but remember: however beautiful the sun looks, it has its dangers too. Like everything, have it in moderation and be protected with eco friendly products like Variosun Spray from EcoHip.